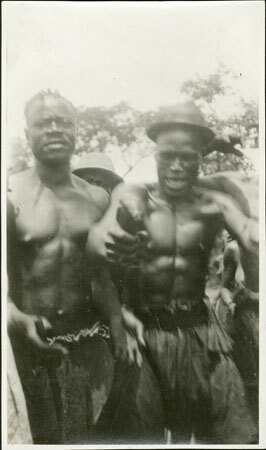 Two men dancing amid a group of others at the homestead of Gami, a commoner governor. To the left is Bagare and to the right wearing a hat is Fuomara [poor focus]. Notes on print/mount - "dancers at Gami's Bagare Fuomara (hat) IV-6 72/4 EPA733"
Notes on card mount m/s pencil - "SS overall"
Morton, Chris. "Zande male dancers" Southern Sudan Project (in development). 03 Jan. 2006. Pitt Rivers Museum. <http://southernsudan.prm.ox.ac.uk/details/1998.341.733.2/>.